Cruising roundtrip from Isla Baltra, Celebrity Flora‘s seven night cruises give guests the opportunity to visit Daphne Island, Bartolome Island and the island of Santa Cruz, among others. 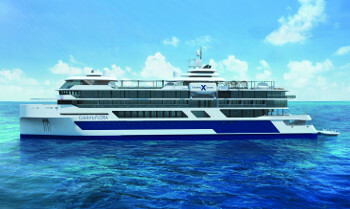 View all Celebrity Flora cruises, view a selection of Celebrity cruise deals, or view more options for Celebrity cruises. This is the hub of activity on board where you’ll enjoy presentations and briefings put on by our Naturalists. You’ll learn all about the activities and excursions you’ll be able to participate in throughout your cruise. Our Naturalists and crew members will guide you in personalising your experience in the islands to ensure your vacation is exactly what youd hoped for. But, the Discovery Lounge isn’t all business. There’s a full bar, a stage for entertainment, and comfortable seating, including sofas and club chairs for relaxing. The walls are almost all glass, so stunning views are always a part of the ambience day and night. Want to learn even more about the Galapagos Islands wildlife? The history of the islands? The sea life in the water just below your feet? Head up to the Observatory a cosy, inviting area featuring a complete library dedicated to the Galapagos Islands. Surrounded by floor-to-ceiling windows (yes, there’s a reason we named it the Observatory), stunning views connect you to the environment at all times even as you learn about it. In the Galapagos Islands, we feature menus crafted by our Michelin-starred chef in two distinct restaurants. Our chef is dedicated to creating an authentic dining program by sourcing the freshest, local ingredients and using the highest quality, sustainable seafood available. All this means you’ll have a culinary journey in the Galapagos like no one else provides. Seaside Restaurant is the main restaurant. It’s a spacious “barefoot chic” space that features destination-inspired design elements and floor-to-ceiling windows throughout for stunning vistas that complement the mouthwatering meals you’ll enjoy here morning, noon, and night.